There’s nothing better than a clean, sweet smelling pooch with a brand new style from the groomer, but did you know there are also many health benefits to professional grooming? At Shoreline Animal Hospital we can make grooming an integral part of your pet’s health care. Allergies and skin infections are extremely common in dogs and cats, and frequent cleansing baths and medicated shampoos prescribed by a veterinarian are a mainstay of management of these uncomfortable problems. Overgrown nails can cause painful curling of toes and lameness. Our groomer is able to closely inspect each pet and often she is able to point out health concerns an owner may not have noticed. Examples include subcutaneous tumors, rashes, wounds, ear infections, dental tartar, fleas and ticks. With early detection, these potential health concerns can be brought to the attention of a veterinarian much more quickly and help keep your pet as healthy and comfortable as possible. Safety and low stress handling is also emphasized in our facility; with a very experienced groomer and a veterinarian always available in case of an emergency, you can leave your pet knowing he is in good hands. For cats that don’t tolerate grooming or clipping we can offer safe, veterinary supervised sedation to make the process much faster and less stressful for the animal. We are a state licensed grooming facility; we do not leave your pet unattended on the grooming table or in the tub, and we do not allow your pet to intermingle with others. We require current vaccinations including Rabies, Distemper, and Bordetella (for dogs) to help protect against easily transmitted diseases. If your dog or cat is not a patient at our practice – don’t worry! We can obtain his vaccine history from your veterinarian prior to his grooming appointment. Our goal is to make grooming safe and easy for both you and your pet. 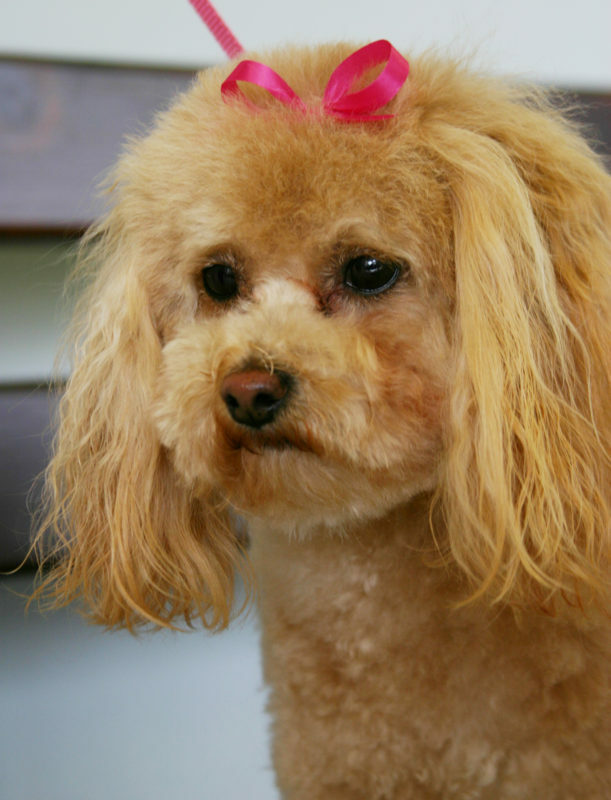 Our groomer, Hollie Goodale, has over 35 years of experience which began in 1979. She apprenticed for 5 years at The Perfect Pooch in North Branford, CT before becoming a full time groomer there for 12 years. She then went out on her own until joining Shoreline Animal Hospital in 2010. Hollie prefers to meet new potential grooming clients so that she can get to know each pet, hear what exactly the client is looking for in a groomer, address any special needs, and give an accurate price. For new puppies we start early with brief visits to get the face, feet, rear and tummy trimmed as they learn to stand on the grooming table and practice holding still. Once Hollie feels they are ready for a full grooming, they graduate to getting a full bath and clip. Hollie is skilled in a variety of breed-specific styles and techniques including hand scissor trimming and hand stripping. She specializes in small and medium breed dogs and she loves to groom cats! Years of experience have given her a good eye for aesthetics, but also an understanding for what may be most practical for each individual. She enjoys working with each client and pet to create a look that is beautiful, functional and healthy! For more information on grooming or to schedule an appointment, please contact us at 860-669-9374. Curiosity or Cure? — The scoop on DNA testing for dogs.